Whether it’s dirt, grime or mould, the outside of your house is under constant attack. Not only can these contaminants negatively affect the appearance of your property, they can also present a number of safety hazards such as a slippery driveway, path or courtyard. High pressure cleaning from Outdoor Cleaning Specialists can solve the problem! Whether it’s your walls, driveway, paths, paving, tiles, roof, courtyard, pergola, balcony or tennis court, our modern high pressure cleaning equipment will have your home looking like new in no time. High pressure cleaning (or pressure washing) is a fast and cost effective way to enhance the look of your home, reduce maintenance costs and minimise slipping hazards. Compared with re-painting, re-paving or renovating, professional high pressure cleaning is much more cost effective, yet still delivers amazing results. For example, high pressure cleaning your driveway is a quick and easy way to increase the ‘curb appeal’ of your property, as the driveway is often the first impression visitors get of your home. 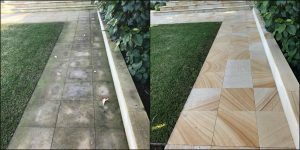 Looking for high pressure cleaning Sydney?